Easyclus© is based on years of experience with handling large amounts of flow cytometric monitoring data. 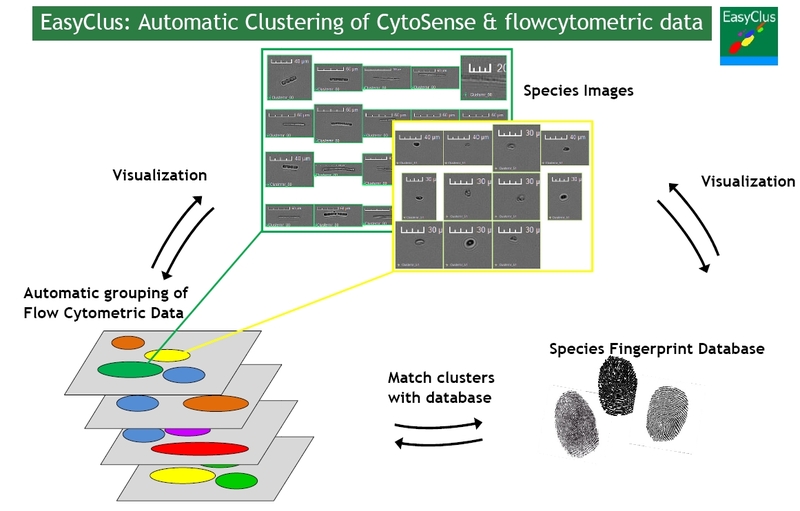 A lot of research, further improvement and development of new algorithms have been acquired to process multivariate flow cytometric datasets automatically and efficiently. To accelerate and improve the use of flowcytometry, robust and objective data analysis software is required. Easyclus© can handle data of a lot of cytometric instruments and is especially optimized for phytoplankton data of CytoSense flowcytometers (CytoBuoy bv). Figure 1: Each particle is characterized by signal profiles, like a finger print. EasyClus groups these fingerprints belonging to specific algae types. Results can be validated by images. Groups of similar fingerprints are stored in a database. Cell sizes, biovolumes, cell concentrations, biomass, chlorophyll and biodiversity indicators are extracted from the cytometric data by EasyClus. GPS synchronization by EasyClus of online flowcytometry data and Ferrybox data equipped with fluorescence sensors. Figure 2: The sum of chlorophyll fluorescence of each particle (FCM) correlates strongly with the total chlorophyll concentration analyzed by traditional techniques. Interpolation between data points is easily performed by EasyClus. High frequent online analysis is one of the advantages of flow cytometry. Direct analysis of fresh biological samples without transportation and changes within the samples, is another important advantage. Easyclus LIVE© is the online flowcytometric analyses e.g. near a river, on a ship or on a platform in a lake combined with realtime data processing and reportage to the internet. Results and the instrument status can be watched on an internet website (also by smartphone) just a few seconds after analysis. Figure 3: Upper left: traffic lights tells you the status of the instrument. In the middle: bars represent the contribution of several size algae fractions in water (count/ml, chlorophyll/ml). Automatic clustering of species groups is done resulting in scatter plots with different groups of algae. Right bottom: Biodiversity changes based on found flow cytometric groups represents the changes in the diversity of algae. Low values mean that only a few species dominates in the water. Results of the phytoplankton monitoring can also be observed easily by smartphone without high download sizes, because the files are kept extremely small.